a discounted price of €24.95. 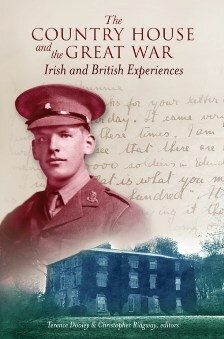 Newly published by Four Courts Press is The Country House and the Great War – Irish and British experiences. As you can see from the Contents list, the 208-page paperback presents a spectrum of experience, from owners, to servants and tenants, as well as the local communities that lived in the shadows of the country houses. These personal narratives identify lost or forgotten figures, uncover unknown stories and military records and excavate the more hidden histories of those who endured the war at home. They are a powerful reminder of the experiences common to many during the 1914–18 period, as well as a record of how individual lives were shaped by personalities and unique circumstances. The book is illustrated with previously unpublished images and has been edited by Terence Dooley, director of the Centre for Historic Irish Houses and Estates, Maynooth University, and Christopher Ridgway, curator at Castle Howard in Yorkshire.